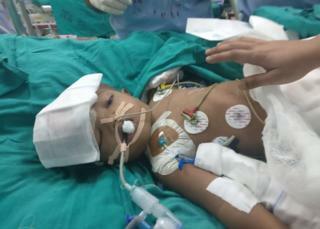 Two-year-old Jaga and Kalia underwent 16 hours of surgery, and are now in the intensive care unit, doctors said. A team of 30 doctors carried out the surgery – the first of its kind in India – at a state-run hospital. The boys were born with shared blood vessels and brain tissues, a very rare condition that occurs once in about three million births. The director of the All India Institute of Medical Sciences, Randeep Guleria, told the Press Trust of India that the “next 18 days would be extremely critical to ascertain the success of the surgery”. The twins, hailing from a village in eastern Orissa state, were joined at the head – a condition known as craniopagus. Even before the operation they had defeated the odds; craniopagus occurs in one in three million births, and 50% of those affected die within 24 hours, doctors say. “Both the children have other health issues as well. While Jaga has heart issues, Kalia has kidney problems,” neurosurgeon A K Mahapatra said. “Though initially Jaga was healthier, now his condition has deteriorated. Kalia is better,” he added. Doctors said the most challenging job after the separation was to “provide a skin cover on both sides of the brain for the children as the surgery had left large holes on their heads”. “If the twins make it, the next step will be reconstructing their skulls,” plastic surgeon Maneesh Singhal said. The first surgery was performed on 28 August when the doctors created a bypass to separate the shared veins that return blood to the heart from the brain.